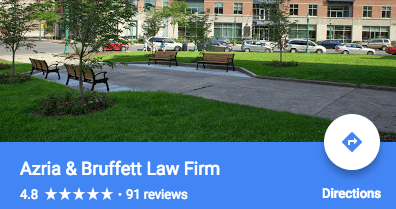 Azria & Bruffett assists clients with DWI, traffic tickets, criminal charges, personal injury, family court, and divorce matters pending in Syracuse and throughout New York State. Speeding and All Other Traffic Tickets​. Pleading guilty to speeding and other traffic violations can have long-term consequences. In addition to fines, points other penalties assessed by the DMV, your insurance company may raise your premiums or even drop coverage. Our firm will answer your questions and help you take the right steps to protect your driving record. DWI (DUI) and Alcohol-Related Charges. A DWI is a serious charge. Our team includes former prosecutors who understand the New York criminal justice system. We will take quick and aggressive action to help you maximize the chance for a favorable outcome in your case. Criminal and Drug Charges. Being charged with a crime can be an overwhelming and frightening experience. Our criminal defense team will explain your legal rights and do everything within their power to protect you and your family at each stage of the process. Personal Injury and Car Accidents. A serious car crash or other accident caused by the negligence of another can change your life in an instant. High-cost medical bills, time off from work, and an extended recovery can leave you and your family struggling financially. Our firm will fight to help protect your rights and recover all compensation you are entitled to receive. Divorce. An uncontested divorce can save parties considerable time and money. If you are seeking a divorce in New York, our attorneys can help you work out an agreement addressing property and asset distribution, child custody, visitation, and other matters. Family Court Cases. Family law issues can be highly charged and emotionally difficult for everyone involved. Our attorneys are professional and caring lawyers who can help you resolve all types of family disputes. Our firm offers a team of knowledgeable professionals, including former prosecutors who have handled the highest level of cases in the New York criminal justice system as well as attorneys who have prior experience litigating sophisticated civil matters. Whether we are taking on a criminal or civil matter, we leverage this knowledge and insight to help our clients get the best possible results. The attorneys at Azria & Bruffett focus on doing all that we can to help our clients. Our attorneys share ideas and work together as a cohesive team to build the best possible case for our clients. Our firm prides itself on being responsive to the individual needs of our clients. We work hard to provide one-on-one attention so that our clients know that they are always our top priority. Every case and every client is personal to us. Our attorneys are driven to achieve success and we will do everything in our power to find the best solution to your legal problems.